There were no injuries or damage to public property. Launched at 1:15 p.m. MDT, May 21, the vehicle was carrying an instrument, developed by LASP, to calibrate the EUV Variability Experiment, or EVE, on NASA’s Solar Dynamics Observatory. Preliminary observations showed that the vehicle landed within the launch range. The payload carrying the experiment separated from the rocket and descended via parachute. NASA is establishing an investigation team to determine the cause of the mishap. 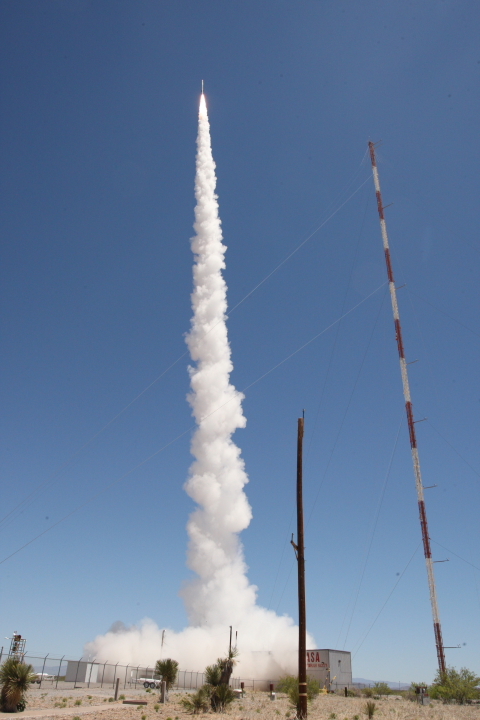 The next Black Brant IX launch is currently scheduled for August 2015 at White Sands. EVE measures the total energy output of the sun, known as irradiance, for each wavelength of light in the extreme ultraviolet range. By tracking the irradiance, scientists can observe how it changes with different events on the sun. None of these wavelengths can penetrate Earth’s atmosphere to reach humans on Earth, but each can have a profound effect on the air above our planet. Some of this light energy gets absorbed in the thermosphere, causing it to expand like a balloon when heated, which can create more drag on satellites in space. Other wavelengths of extreme ultraviolet light can have an effect on the composition of the charged ions in Earth’s ionosphere, which can hinder radio communications or GPS navigation systems. What’s more, the total amount of each kind of light changes in different ways based on what’s happening on the sun, including such things as the approximately 11-year solar cycle during which the sun ramps up to a time of more eruptions and magnetic activity—called solar maximum—and back down again to the quiet of solar minimum. While one wavelength of light might increase only by about 60 percent over this solar cycle, another wavelength might grow to be 100 times stronger. As scientists seek to understand how changes on the sun affect our home planet, they need to parse out the details of what causes an increase in the different kinds of light waves. All of this research about events on the sun and potential effects at Earth, depend on accurate measurements of the total solar energy output. This, in turn, leads to the job of calibrating EVE approximately once a year. While launched with EVE in mind, the May sounding rocket will also, in fact, serve as a calibration tool for a number of solar EUV instruments currently in space. The calibration mission flight lasts for approximately 15 minutes, affording five minutes of prime solar viewing time. Such short sounding rocket flights allow for solid research via relatively low-cost access to space.